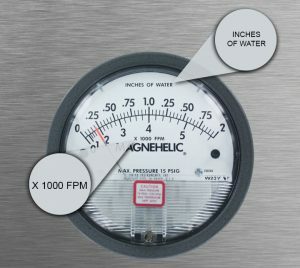 A common flow measuring application is using a Magnehelic® Differential Pressure Gage with a Pitot Tube to measure velocity pressure. This velocity pressure can then be easily converted into velocity or flow rate. It is also common to measure flow using a Capsuhelic® Differential Pressure Gage with an In-Line Flow Sensor, such as the Dwyer Series DS. The Series DS is a very popular sensor for liquid flow monitoring applications. Instead of having to do the calculations manually, Dwyer offers correlated square root scales to read directly in velocity or flow rate. Dwyer can create custom scales in any scale range and in many units, such as CFH, CFM, FPM, GPH, GPM, LPM, M3H, and PPH. To do the scale calibration, we would need to know the velocity or flow rate at a given velocity pressure. 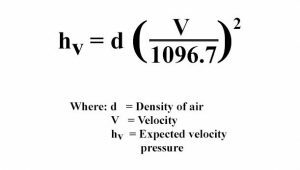 This is calculated for air velocity using a Pitot tube with the equation shown below, with d being the density of air, V being the velocity, and HV being the expected velocity pressure at that velocity. If a flow rate scale is desired, then from velocity it is then easy to calculate volume flow rate with flow rate Q equal to the velocity multiplied with the cross sectional area of the duct or pipe. If using a Series DS In-Line Flow Sensor, Dwyer offers a web-based Flow Calculator that can be used to calculate the expected velocity pressure based on inputting the pipe size, flow rate, temperature, and static line pressure. Please contact our Technical Sales Department for more help if needed at tech@dwyer-inst.com. 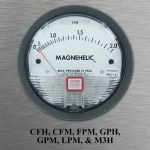 For the Magnehelic® Differential Pressure Gage, you can also select and order dual scales that read velocity pressure and velocity in either feet per minute or meters per second. Dual scales can be ordered directly from our website.